In the U.S., peanuts are an important crop in the U.S. southeastern states and southeastern states, partly due to the work of the African-American botanist George Washington Carver, who in the 1920s and 1930s promoted them as an alternative crop to cotton; he famously described about 300 different products made from peanuts, many of which he himself developed. 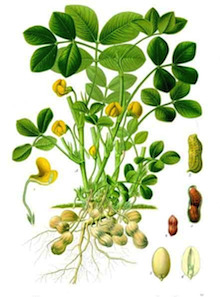 The peanut or groundnut (also known as groundnuts, earthnuts, goober peas, monkey nuts, pygmy nuts and pig nuts), is an annual herbaceous plant in the Fabaceae (legume or bean family) now grown in tropical and warm-temperate regions worldwide for its seeds and their oil. The seeds contain up to 50% oil making it one of the important oilseed crops in the world. After pollination, the flower stalks elongate, growing to 6 cm long, and push the developing pods into the ground, so that the fruit must be dug up from the soil to be harvested. The latin term hypogaea refers to this "below+ground" growth of the pod. Although appearing as and referred to as a nut, it is actually the underground pod of a legume, rather than a true nut. The fruit is an indehiscent legume (a pod that does not have sutures or split open freely), typically containing 1 to 3 soft seeds (sometimes as many as 6). Cultivated peanut originated and was domesticated in South and Central America 3-5 thousand years ago, derived all of its genetic material from two wild ancestors, A. duranensis and A. ipaensis whose genomes merged several thousand years ago, in a rare genetic event. The wild species, therefore, have half as much genetic material as cultivated peanut. These two “simpler” genomes have first been sequenced toward achieving its ultimate goal: the complete genomic sequence for cultivated peanut. The cultivated peanut is an allotetraploid (AABB, 2n=4x=40) that carries the A genome from A. duranensis and the B genome from A. ipaensis. These two ancestral diploids separated from each other about 3 million years ago. The genome merger, allopolyploidy event, ocurred relatively very recently, five to ten thousand years ago, followed by domestication in South America from where it appeared in most part of the world by 1600. The peanut genome is being sequenced and analyzed as part of the Peanut Genomics Initiative, in order to accelerate breeding progress and get more productive, disease-resistant, stress-tolerant varieties to farmers. The strategy to sequence the tetraploid peanut genome will make use of the diploid progenitors to help identify the similar chromosomes in cultivated peanut. This strategy will also better enable breeders and scientists to make use of greater genetic diversity in the close relatives of peanut. News and status: This website is, as of June 2013, brand-new (first turned on June 13). Content and functionality is currently minimal, but this will change rapidly through 2013 and 2014, leading to a web site with much of the functionality of SoyBase, with an audience of both genomic biologists and peanut breeders. Selected map, QTL, and trait data will be added first (in June and July). This will be expanded through 2013 and 2014. Map, marker, and transcriptome data sets will be added through this time as well, and the sequence search tools will be added (there is currently a minimally configured instance of Blast). Genomic sequence browsers will be added as soon as this data is assembled and public (likely in 2014); and resequencing and haplotype viewers shortly afterwards. Extensive interlinking among data sites, within and between species, will be possible once the genome sequences are complete. This website and much of the data-to-come have been made possible by funds from The Peanut Foundation and by the many contributors to the Peanut Genomics Initiative.